So, I'm sat here watching/listening to MTV2... so far I have been treated to guns 'n' roses, pearl jam, vintage blur , rage against the machine and now some awesome smashing pumpkins :-) All with a cheeky glass of red wine (a very small one, mind) as my Carlsberg 0.5% lager has run out, boo :-( it has truly become one of the staples of my diet as I'm trying to lay off the 'real' stuff! god, that sounds like my spam folder! Muscle & Fitness I am very impressed with, however... despite the really scary looking body builders featured in the ads! I like the fact that their homepage title goes "...the Bodybuilding Magazine for fitter, stro..." and then stops... it's almost like my blog title... c'mon! So, they've got some great articles, including one on the legend that was Bruce Lee. But the article that really caught my attention was one on nutrition... a subject that I've always had a huge interest in - I wanted to become a dietitian after thinking what a fabulous job the one at King's College Hospital did after I gave birth (13 years ago next Tuesday! ), I was in for 2 weeks as my son was quite premature and was ravenously hungry, she was just fantastic, I was so impressed. I ended up in IT, for my sins, oh well! Still always been (probably a little too) interested in the food I consume, hence why I've used Weight Loss Resources for the past few years... okay I have strayed to other sites but have always come back to WLR, it satisfies the huge food geek in me!! We've listed the top 25 foods that should be a regular part of your training table. EATING CLEAN GETS A BAD RAP. the (rather) good news (for me) is that 99% of the foods listed are already firmly ensconced in my diet, although not given the priority and due attention/exposure that they obviously so fully deserve! In brief (yeah right, I hear you say), yesterday I had brown rice, salmon and broccoli (remember that! 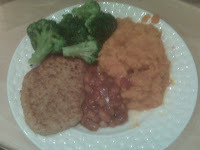 ), today we had quorn escalopes with sweet potato and carrot mash as well as mixed spicy beans and broccoli, jolly nice it was too - even my son loved the mash, commenting on how filling it was as well as tasty! 3) and then write/bore you to tears about them. Hi! I saw that you were following my blog and I got super excited. I think it's great that you are trying so hard to lose weight. Congrats on making your own meals and making them healthy. It looks like we eat practically the same diet. I make my meals in advance and then freeze them. That way I don't have to cook every single day of the week. Yeah, I was browsing through blogs and I came across yours so I thought I'd take a look :-) I *love* your poem, it's such a strong and far from negative message! It's great that you're fighting this in such a positive and inspirational way as it's a totally crap thing to happen to such a beautiful young woman! Thank you so, so, so much! Your words are too kind. I wasn't expecting much of anyone to read my blog. I kept thinking that I wasn't that interesting. I miss England, I was there a few years back for a trip. I fell in love with Sainsbury's. I know it's just a grocery store but it was fantastic. Don't even get me started on the Galaxy bar. But I've cut most bad stuff out of my diet. Like sugar! my thing is leaving milk in the communal fridge... and just forgetting about it... I'll go in for some yogurt and there'll be a little pint of lumpy skimmed milk with my initials written on it... whoops!